Its great you have reached this page that means your interested in adoption but, i just want you to think carefully about a few things before we go any further. Why are there so may unwanted Guinea Pigs ?? People buy them for the wrong reasons - common example is pressure by children. Home and family circumstances can change - House move,rented accomodation. People did not research fully what was involved with owning Guinea Pigs. People buy new pets !!! "The kids have lost interest"
"Its too cold to go out and feed them"
" I never wanted them it was the kids who bugged me"
" Kids are older now and have lost interest"
"Since the new puppy came along i cant cope with Guinea Pigs too"
" I am struggling with a new baby and Guinea Pigs "
" They were a gift but i dont like them"
" Cant afford it now, what with our new kitten and all"
" They squeak and make funny noises "............ yes i know. Now we know life does change and who knows whats around the corner, but it seriously pays to do your homework and have a really good think before taking on Guinea Pigs or any pet. Its a long term committment 4 to 8 years. 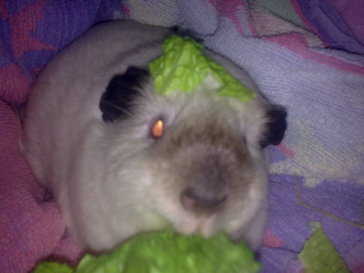 1:We only rehome single Guinea Pigs to live with an existing companion. 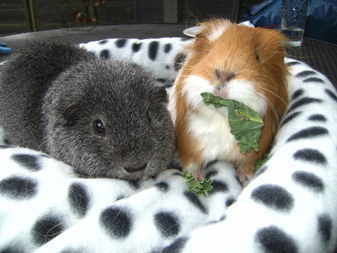 We rehome Guinea Pigs in bonded pairs, occasionally sow trios. Descriptions of our available Guinea pigs are clearly listed on our web site. Adoption donation for a NEUTERED boar is £50 this will cover our surgery costs,medication and post operative care. We match our Guinea Pigs with your circumstances - A set up check will be carried out by one of the rescue team prior to adoption. All our guinea pigs are re-homed on the basis that they are not to be used for breeding.We cannot guarantee the age of sows, so it is important sows are not bred from. Birth problems can occur in sows that have not had a litter before the age of 12 months. Most of our rescue guinea pigs boars and sows have already had a difficult time and just want a peaceful loving home free from extra stress. All Adoptions are considered on an individual basis by the rescue manager whose decision is final. 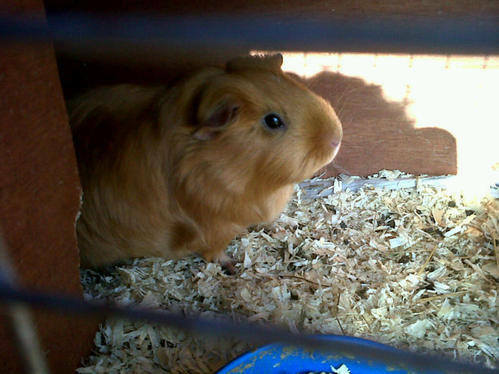 2:Quarantine of two weeks is applied to all Guinea Pigs we receive into the rescue. A full health check and mite treatment will be carried out during this time. 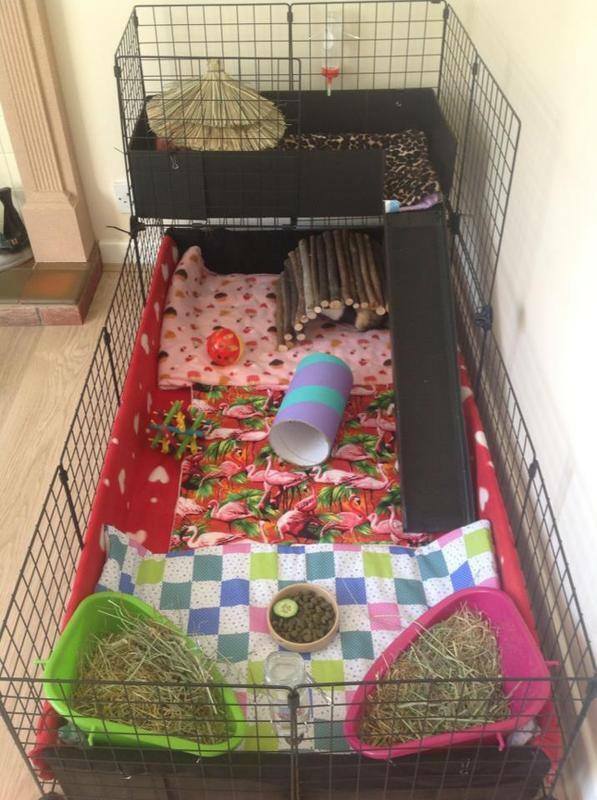 Owners who have experience of guinea pig care have the choice to carry out quarantine themselves at home and before introducing a guinea pig to an existing Guinea Pig.The wellbeing of a depressed guinea pig is paramount and the benefits of exclusion have to be weighed up. Guinea pigs can be placed near to one another so at least they can share conversation and smells. This is occasionally done with neutered boars. If you live in a rented property please check with your landlord you can have Guinea Pigs in your home. 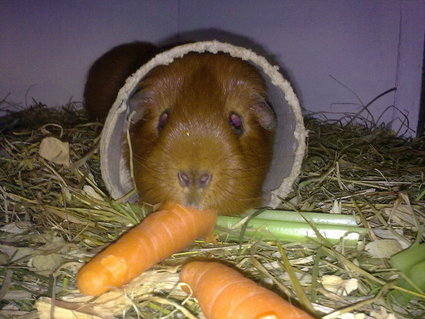 We only rehome indoor Guinea Pigs to SMOKE FREE homes - see web link page for information why. Outdoor definition : Garage / Shed -with lighting and insulation. Area not used for car storage. You may choose to also have an outdoor hutch during summer months but you must be able to show evidence of acomodation required. 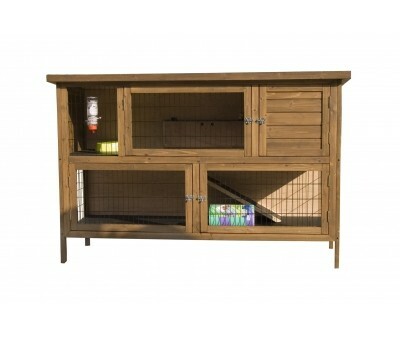 An example of hutch and hutch with ramp, there are many brands available. This size gives plenty of room for toys and tunnels. Various brands available on the internet, Zooplus sell a good range of indoor cages at good prices. This a 140cm - a great size for Guinea Pigs. Adoptees agree to ensure the guinea pig is fed fresh meadow hay, a varied fresh vegetable diet and dried nuggets with added vitamin C .
Hay and fresh water MUST be available at all times. Dishes and water bottles must be cleaned weekly - NO GREEN BOTTLES PLEASE ! The rescue advises a low calcium diet to help avoid bladder problems - information sheets available on our webs link page. Adoptees agree to register the guinea pig with a RCVS small animal veterinary practice and seek prompt care for a sick Guinea Pig it is a legal responsibility under the 2006 Animal Welfare Act. Adoptees agree to ensure regular health checks are carried out along with regular preventative treatment for skin parasites. All our guinea pigs are treated with a course of Ivermectin before they leave the rescue. Its important good skin care is maintained as we cannot guarantee your Guinea Pig will never get a mite or fungal infection,its something piggies can occasionally get from Hay, housing conditions or grazing on lawns.It is important you see your vet promptly with any skin changes. Adoptees agree to ensure lots of cuddles and attention are given on a regular basis, play things must be provided to make cage time interesting. 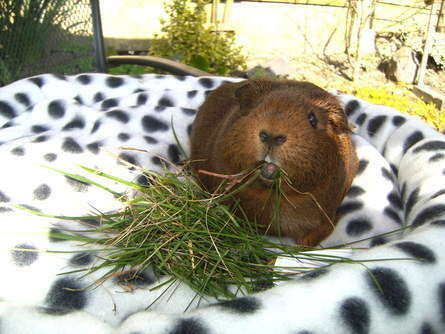 Guinea Pigs need regular exercise and an indoor / outdoor run of some type is essential, lawn or not. Parents – Guinea pigs can live for 4 to 8 years !!! 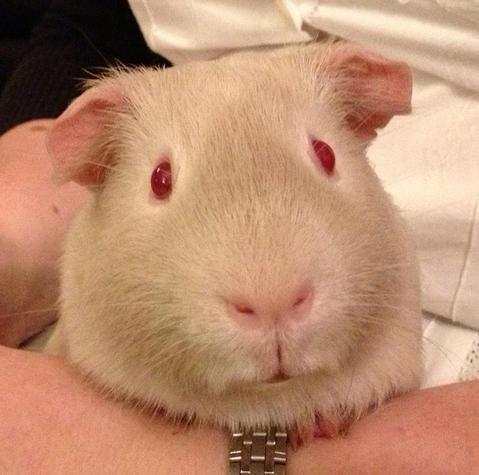 Do not adopt Guinea Pigs unless you are the willing primary carer !! We have found that one of the main reasons for unwanted guinea pigs is that they are bought for children and the children lose interest.The parents were not really interested in Guinea Pigs and therefore want to rehome them.Its a shame and large retail pet stores make it easier to buy Guinea Pigs on a whim,without really considering the responsibility required. We love it when families tell us they have been researching and thinking about Guinea Pigs for several months !!! Hooray ! Be prepared to cultivate their interest,ensure they find out as much as they can about Guinea Pigs and teach them about being a responsible pet owner by being a good example yourself. 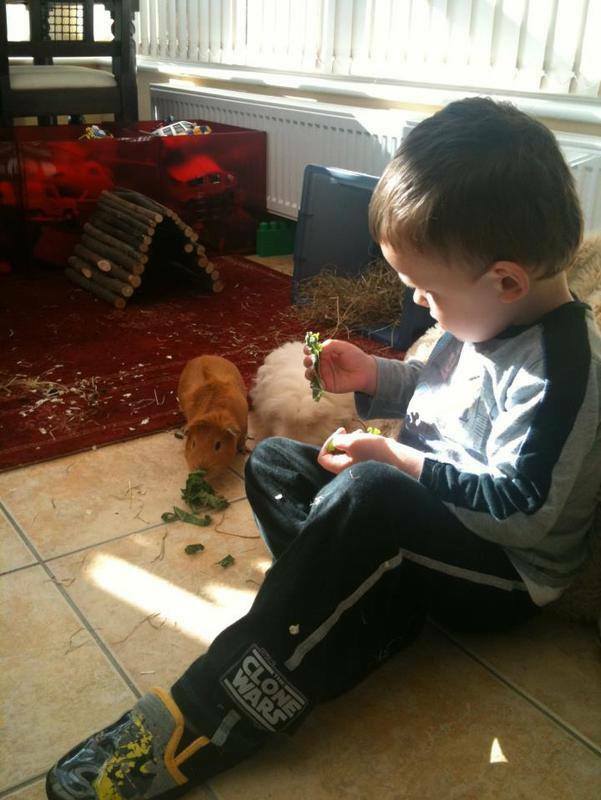 We do ask parents to consider the committment required before re-homing a guinea pig, parents must be the primary carer and encourage the child’s on going interest and take an active role in the guinea pigs care. Guinea pigs are wonderful, interesting animals and their care can be made educationally interesting and prove a valuable part of gaining citizenship and social skills.The rescue can give you lots of tips and information. We do not rehome to schools / nurseries. Pets are a 24 hour responsibility not just in school hours,we feel it sets a very bad example to leave pets unattended at school. Sending Guinea Pigs home with different people can be distressing. Please read our page why we dont adopt to schools and nurseries. If your circumstances genuinely change and you can no longer keep your adopted Guinea Pigs then please contact us,to arrange returning them to the rescue. Donations are non refundable. Thats it,if you are interested in adoption and can comply please get in touch with us ! !